Get maximum effectiveness from organic pesticides and foliar nutrients with improved spreading, wetting and penetration. OROBOOST® is a WSDA-registered organic adjuvant*, formulated specifically to make organic herbicides, insecticides, miticides, fungicides and foliar nutrients work harder. In addition to improving spreading, wetting and penetration, OROBOOST is the only organic adjuvant with proprietary TransPhloemTM technology that accelerates input translocation throughout plants, including roots, to deliver active ingredients for quicker and better results. A recent University of Illinois study concluded OROBOOST-treated applications are absorbed into the leaf more quickly, and move a greater percentage of the systemic pesticide to the roots faster than pesticide alone. OROBOOST also provides versatility through mix rates that allow you to control where and how your inputs are delivered on, or in, plants. *OROBOOST is registered organic only when tank mixed with at least one other registered organic pesticide. OROBOOST is designed to provide organic growers a powerful tool for improved control of insects, weeds and fungus, as well as realizing maximum benefits from foliar nutrient applications. It is approved for use with all organic pesticides and foliar nutrients to improve spreading and absorption. The unique versatility of OROBOOST is further increased through mix rates. At lower rates, 20-32 ounces/100 gallons of spray solution, it is a superior spreader that gives contact pesticides excellent coverage on the leaf surface. When OROBOOST is used at higher rates, greater than 32 ounces/100 gallons, it penetrates the leaf surface allowing its patented TransPhloemTM technology to move systemic pesticides and nutrients throughout the plant for rapid translocation. Better penetration. Better spreading. Better results. OROBOOST organic adjuvant with TransPhloemTM technology delivers more of the active ingredients in herbicides, fungicides and insecticides to dramatically improve pesticide performance. Flexibility through tank mix amounts allows you to control the amount of spreading or penetration for ideal application of inputs. Better penetration at higher mix rates. OROBOOST with proprietary TransPhloemTM technology accelerates the movement of systemic pesticides into a plant’s phloem for rapid translocation of active ingredients and maximum input effectiveness. Red indicates a high concentration of pesticide that has been translocated to the roots. 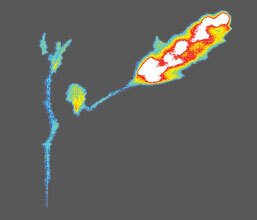 The absence of the plant stem or root images indicate the systemic pesticide has not been translocated to this portion of the plant. Better spreading at lower mix rates. Effective foliar-applied pest and disease control relies on good leaf surface coverage. Organic OROBOOST reduces surface tension to provide excellent wetting, coverage and delivery of a greater number of droplets in a more uniform droplet size compared to other adjuvant types. Improved spreading and absorption for healthier crops. OROBOOST organic adjuvant increases nutrient uptake and distribution of foliar fertilization by promoting superior deposition and penetration through leaf surfaces. TransPhloemTM technology, found only in Oro Agri products like OROBOOST, allows for faster and more complete nutrient movement into and throughout plants than other adjuvants and surfactants. Better absorption with OROBOOST’s proprietary formulation can reduce fertilization costs and increase quality and the potential for higher yields. The CPDA voluntary Adjuvant Certification Program is the first of its kind. Since its launch in 2001, it has quickly gained industry recognition as an innovative tool for encouraging product stewardship in the manufacture of agricultural adjuvants. Prior to this program, end users had little, if any, scientifically accepted standards by which they could effectively judge the quality of a tank-mix adjuvant. Members of the CPDA Adjuvants and Inerts Committee developed the program to bring a level of consistency in product performance for adjuvants used with agricultural pesticide formulations. Products certified under the program must meet 17 separate benchmarks that are based on technologically and scientifically derived definitions and standards adopted by the American Society for Testing and Materials, now known as ASTM International, and certain requirements of the U.S. Environmental Protection Agency (EPA), the U.S. Department of Transportation, and the U.S. Occupational Safety and Health Administration. Agricultural spray adjuvants are not subject to federal regulation by the EPA. When users purchase a CPDA-certified adjuvant product, they have the assurance that the product meets the functionality claims indicated on the label according to a specified, uniform set of standards, and that ingredients used in the product meet EPA regulations for approved ingredients for use in pesticide tank mixes. The ASTM International standards E 1519-06ae1 and E 609-05 (available for purchase on the ASTM website) provide the structure for ensuring an adjuvant product is of high quality and reliability. Pesticide registrants and users will have the assurance that the product will meet its performance claims and that all product labeling guidelines have been followed. *Always read and follow the product labels for more complete information and application directions. OROBOOST is a spreader, wetting aid and penetrant to improve distribution and efficacy of miticides, insecticides, fungicides, herbicides, and nutrients. OROBOOST is a WSDA-registered material for use in organic agriculture when combined with other organic pesticides. Prior to use, read all the directions on this label and on the label of the manufacturer’s insecticides, miticides, fungicides, plant growth regulators, dormant oils and/or nutrients being used with this product. The manufacturer’s label for specific usage and restrictions has precedence over directions for use referred to on the OROBOOST label. To ensure thorough mixing, it is suggested that you recirculate mini tanks and bulk tanks or shake containers before using. Ensure spray equipment is thoroughly cleaned before using OROBOOST. Coatings on inner tank and spray lines, from previous chemicals sprayed, may be dissolved by OROBOOST, thereby releasing it into the mix about to be sprayed. If in doubt, applying as directed, add 20 ounces of OROBOOST to 20 gallons of water and circulate through system for 20 minutes, spray to waste. Thereafter, mix as prescribed for regular spraying. Treat a small area and observe results. If the results are satisfactory, proceed with a complete application. WARNING: Do not apply to fruiting stages of pome fruit, cherries, table grapes or other sensitive or stressed crops without first consulting your Oro Agri distributor or representative. Test for compatibility when combining in tank mixes with EC products, copper and/or chlorpyrifos on sensitive crops. 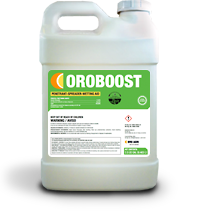 NOTE: OROBOOST reduces dew formation for up to 7 days and therefore may increase the risk of frost damage in frost prone areas. NOTE: NOT FOR AQUATIC USE. Fill tank one-half full with water. Add the required amount of other tank mix products while agitating. Add remainder of the water. Add the recommended amount of OROBOOST last and continue agitation until completion of spraying. For best results, use within 24 hours of mixing. Antifoam and buffering agents may be used if required. Add 1 to 3 Quarts of OROBOOST per acre in sufficient tank – mix spray water volume to adequately wet target.